Obama was cheered by thousands in Johannesburg’s Wanderers Stadium as he marked the centenary of Nelson Mandela’s birth by urging respect for human rights, the free press and other values he said were under threat. He rallied people to keep alive the ideals that the anti-apartheid activist worked for as the first black president of South Africa, including democracy, diversity, gender equality and tolerance. “We see much of the world threatening to return to a more dangerous, more brutal, way of doing business,” he said. The “politics of fear, resentment, retrenchment” are on the move “at a pace unimaginable just a few years ago,” Obama added. “Those in power seek to undermine every institution ... that gives democracy meaning,” he said. He noted the “utter loss of shame among political leaders when they're caught in a lie and they just double down and lie some more,” warning that the denial of facts – such as climate change – could be the undoing of democracy. The crowd gave him a standing ovation in the chilly South African winter. 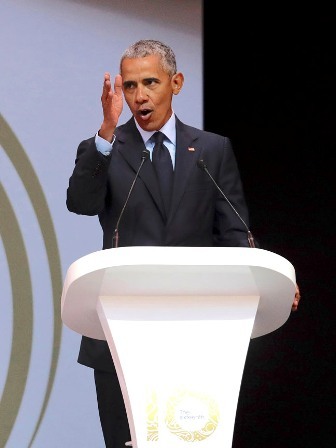 “Just by standing on the stage honoring Nelson Mandela, Obama is delivering an eloquent rebuke to Trump,” said John Stremlau, professor of international relations at Witwatersrand University in Johannesburg. This was Obama’s first trip to Africa since leaving office in 2017. Earlier this week, he stopped in Kenya, where he visited the rural birthplace of his late father. Obama’s speech noted how Mandela, who was imprisoned for 27 years, kept up his campaign against what appeared to be insurmountable odds to end apartheid, South Africa’s harsh system of white minority rule. Mandela, who was released from prison in 1990 and became president four years later, died in 2013 at the age of 95. He left a powerful legacy of reconciliation and diversity along with a resistance to inequality – economic and otherwise. Obama’s speech drew on his great admiration for Mandela, a fellow Nobel Peace Prize winner whom America’s first Black president saw as a mentor. When Obama was a U.S. senator, he had his picture taken with Mandela. After Obama became president he sent a copy of the photo to Mandela, who kept it in his office. Obama also made a point of visiting Mandela’s prison cell and gave a moving eulogy at Mandela’s memorial service in 2013, saying the South African had inspired him.